So, it’s time for you to begin the search for an upgraded patio door for your Toronto, ON home. Great! The pending summer will be that much more enjoyable with your beautiful new door to backdrop your space. First thing’s first, though; do you know what you’re planning to get? Have you decided between a sliding glass door or a swing-open door? To help you just a bit, the experts here at Brock Doors and Windows want to walk you through some details regarding our most popular option: the sliding patio door. Head: the top portion of the door, horizontal and parallel to the floor. Jamb: the side parts which meet the head at a 90-degree angle and run the entire length of the door frame. Still: the bottom portion of the door, horizontal and parallel to the ceiling. The sill houses the bottom of the door and “pushes” rain water away. This is the biggest part of the door—the same as what we call the “sash” of a window. This is the whole part which slides right and left to open and close—or, it remains stationary. Depending on the customizations you choose with your sliding door, you may have multiple panels that are operable (movable). Just as a train needs a rail to keep it in place and on-track, so does a sliding patio door. That’s the exact job of the rail on our doors here at Brock! Obviously, patio doors don’t simply slide across the rail… there are small wheels which allow it to smoothly operate—we call them rollers. We know you know what this is. But, to be thorough… The glass is the coverage on a patio door panel. You can add coatings for extra sun protection and improved energy efficiency—just ask us how! Arguably, the lock system is the most important part. You want your home to be safe and secure. So, let’s discuss our various options so you know you’re safe behind your new sliding patio door. There, now you know exactly how to talk to a patio door specialist like an in-the-know homeowner! 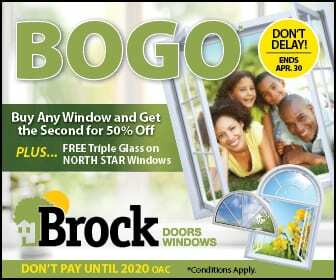 We hope your search for that perfect sliding patio door in Toronto begins here with us, at Brock Doors and Windows!